NEW YORK (AP) -- Crunchy snow and ice greeted designers, models and fans at New York Fashion Week on Friday, a day after a snowstorm pummeled the city. 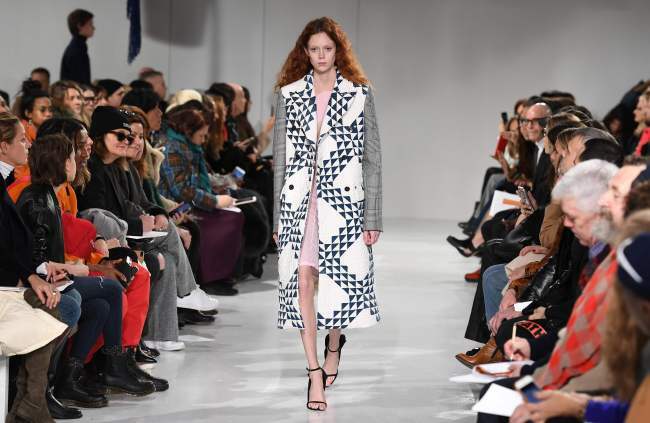 What visitors got was a high-profile debut and a political message at Calvin Klein, some psychedelic designs (and more politics) from Jeremy Scott, a focus on femininity from Jason Wu, and not one but two collections by Kate Spade. “When you have a voice, you should use it,” Simons said backstage just last week at his own label’s menswear show. And now, for his much-awaited bow Friday morning with new employer Calvin Klein -- for which he has moved to New York -- the Belgian designer was using his. There were nods to the American West for both women and men, with denim jackets over loose jeans, or colorful cowboy-style shirts. There was sporty America, in striped tube-sock sleeves -- similar to the arm-warmers shown by his men’s label. There were crisp business-like suits in black and white, and coats in colorful quilt patterns. For some flash, there were a number of garments -- dresses, coats, skirts -- encased in a layer of plastic, looking like cellophane wrapping on a gift. In one dress, the plastic shielded a burst of feathers in white, yellow and black. A golden yellow furry coat also had this laminated effect. Another common embellishment was a silver metallic flower, appearing on black leather jackets or sheer mesh tops that left little to the imagination. There were Jesus portraits on velvet. Sequined Cleopatra-style headdresses. A white feathered tiara several feet high. A baby doll nightie saying “Love Stinks.” A tearful Marilyn Monroe face. Sparkling gold go-go boots. A guy in a kilt AND ripped jeans. Another guy draped in a stole that looked like a toy fox. Yes, it was Jeremy Scott, awakening the tired, cold Fashion Week masses Friday evening with his psychedelic designs. Backstage before the show in a packed West Village venue, Scott said he had been thinking about iconography and politics. It was back in 2009 that Jason Wu vaulted to prominence as the chosen designer of Michelle Obama’s first inaugural gown. For good measure, he repeated the feat four years later. This year, he’s celebrating the 10th anniversary of his label, and he marked the occasion Friday with a display of wearable, elegant designs at the St. Regis Hotel that showed his talent for turning out pretty yet unfussy clothes.